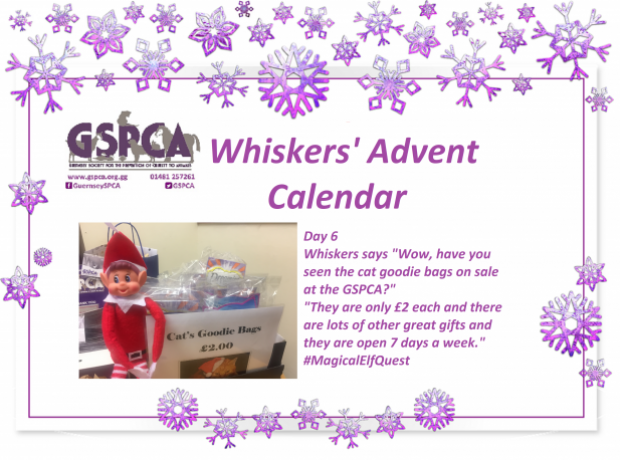 It’s the 6th of December and today Whiskers our naughty little elf said "Wow, have you seen the cat goodie bags on sale at the GSPCA?" "They are only £2 each and there are lots of other great gifts and they are open 7 days a week." The GSPCA Shop and Charity Shop are open 7 days a week Monday to Saturday 9am to 5pm and Sunday 11am to 4pm. To great all sorts of great Christmas gifts pop to the Shelter which you can find us at GSPCA, Rue des Truchots, St Andrews, Guernsey GY6 8UD and Perry Guide page 24 A1 off Route de la Croix au Bailiff.